Do you know a 16-24 year old who could use up to £1000 to run a social action project? Are you working with young people aged 16 – 24 who are not in education or employment? Would you like to support them to run a social action programme with funding of up to £1000, with an additional contribution for youth workers support time? Starbucks Youth Action inspires, empowers and supports young people make a difference in their communities by applying for up to £1000 funding to get their projects off the ground. In 2014, successful projects in Wales included a music festival promoting the Welsh language, a project giving young people sailing and water safety skills and an intergenerational community project. To apply, two young people need to lead the project and engage a further 50 young people throughout the course of the project. The young people will need to be aged between 16 and 24 and need to have a youth worker / training organisation able to support them throughout the project. We are looking for projects that provide a positive benefit to the local community and that look to enhance the young leaders employability and leadership skills. To support young people through their project they will be given access to a specially designed App which can be download in order to keep track of their project milestones and achievements while supporting them with the planning and delivery of their social action project. All workers supporting young people will receive a copy of our employability toolkit to run through employment ready sessions and the QCF Unit Leadership pack, which will provide activities and recording documents for the young person to complete to gain their QCF unit in Leadership. In addition, young people will have access to job and apprenticeship vacancies within the Starbucks Coffee Chain. The programme is primarily focused on young people not in education or employment although strong applications from other applicants will be considered. This is a rolling programme until March 2016. 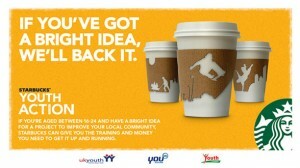 We are delighted to have been able to fund 11 Starbucks Youth Action projects across Wales this year. The kayak safaris will take place on a weekly basis during the summer holidays, for 60 16-24 year olds. We will be pausing at various locations along the River Tawe, Swansea, where we will discuss local environmental concerns, what organisations such as Clear Streams are doing to improve these, and finally identify wildlife in the local area. Swansea is currently failing to achieve ‘good’ status under the European Water Framework Directive. We believe that although a great deal of time and financial resources could be put into treating water pollution, a more sustainable, long term approach to reducing water pollution is to target communities at the source. This project will provide the young people involved with a connection to their water environment. Promote and increase the interest in dance within local communities and provide opportunities for young people to participate and learn new skills, getting the chance to put to use their level one dance leaders qualification. The project will help to identify the individuals who are dedicated, ambitious and driven enough to overcome the challenges they will face over the period of 12 weeks, highlighting within the right provision the young people can achieve job opportunities within their chosen creative professions, encouraging the young people to be both good and active citizens, engendering self-respect and respect for others. To provide a healthy living and fitness project that will help young people who are on a low income or living alone. This project aims to show young people how they can make healthy meals that will last 2-3 days instead of buying fast food. Also this project will show young people that fitness is not just about exercise but it can be fun and educational as well. We will provide workshops such as cookery, Zumba, veg patch and many more, we want to bring this out into the community so that anyone can join. Revamped is a unique project that will take donations of good quality furniture too good to waste. We will redesign, repair and revamp new life into old re-decorating individual bespoke pieces, creating skills based opportunities, trading the pieces, taking orders and creating an identity. We will customise and redecorate using colour, stencil and effects creating an individual one off design. We can engage a wide range of skills at a variety of levels and speciality talents. Celtic Clothing’ is a unique project with the aim to upcycle clothing, addressing money saving and economic value. We are extremely challenged in this current environment with high unemployment and increasing prices on designer ‘label’ clothing with more pressure to ‘fit in’. We want to create quality clothes whilst saving money. We will take good quality materials from Charity shops or our own wardrobes use the material, buttons, zips, lace, etc to redesign our own unique pieces. We have learnt valuable specialist skills in sewing, designing, repairing, recycling and production. We will upcycle and re-cycle clothing to gain skills, save money, build confidence, create identity and represent young people in a positive light. We will purchase extensive high quality Aerial and Rigging Equipment in order to provide young people with the skills needed to teach and perform circus skills, enabling them to gain meaningful employment through the circus industry. Young people in this area need a platform to help them develop personal and professional attributes, something that is lacking in this area of deprivation. We will be providing activities for 80 young people during the summer holidays. This will benefit the parents as there will be fewer arguments at home and the youths will be ready to learn when they go back to school so schools will benefit. We will be working with local agencies and communities. Our aims are to bring the local community together, young people will meet new friends and it will help them with transition between year groups when they go back to school. We will recruit more volunteers there will be less boredom and anti-social behaviour. Sea and river survival, danger points and to learn about the risks, spot danger and keep safe. Pass on the learning skills to local children. Inform them about safe water fun, new projects with kayaking, sailing safe in Rhyl. It’s all organised with volunteers from both groups. 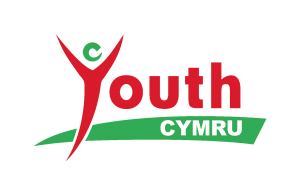 We have 6 more young members waiting for us to pass our RYA and become volunteers at the lake in Rhyl and here in Rhuddlan.